Published by Actigram Labs, Inc.
Admit it – counting steps gets boring. Take your health & fitness goals to the next level – it's time to start turfing! Turf.ly is Clash of Clans meets Foursquare meets Runkeeper. Turf.ly is an exciting game of pedestrian turf wars for anyone who wants to get more activity in their daily life or just find more friends to go running. Turf.ly divides the world into a grid of virtual neighborhood blocks ("turfs") which you capture by out-tracking your friends and other players. Turf.ly makes it a breeze to play by auto-tracking all your activities. The way to play is up to you – go for victory in highly contested turfs or explore uncharted territories. Strategically deploy bonus points to your friends' favorite turfs or reward your friends for their activities. There's only one rule: you must run or walk through a turf to win points to build your turf empire. Turf.ly app for Apple Watch users takes your game to the next level: the world's first real-time live-route running/walking app for Apple Watch with day/night mode to maximize visibility in all conditions. See your whole route in the glance view or zoom in/out on your location in the full app. No start or stop buttons – just hit the road! • Compare and share maps or tracks! 1. Build your turf – a heat map of where you're active over time. 3. Inspire a healthy and active lifestyle. 4. Discover neighbors and friends and help them stay fit and active. 5. Make exercise fun for the first time! 6. Builds accurate health data more easily! - New in Turf.ly 2.0! Turfly needs to run in the background to track your activities, which means you will need to have background app refresh turned on. Check your Turf.ly settings for a shortcut to your iPhone settings. Continued use of GPS running in the background can dramatically decrease battery life. 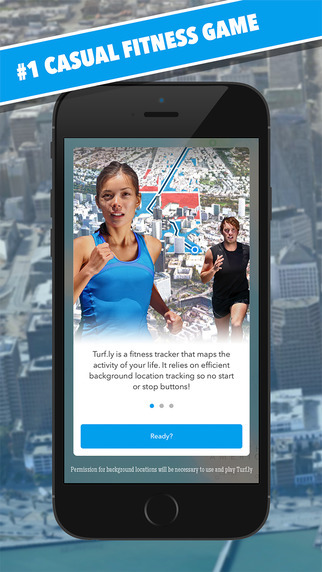 Turf.ly uses GPS and other sensors ONLY when necessary and based on your activities so that it’s one of the most efficient trackers in the App Store. For iPhones 4, 5 and 5C, you will need to set your tracker to High to be able to track in the background. Have any problems or suggestions? We would love to hear from you! You can reach us for support using the in-app chat support under Settings. We try to get back to you within a couple of hours. Fixed a couple of bugs that lead to getting points while driving – no cheating now!